Water Heaters - Haldeman Mechanical, Inc. Water Heaters - Haldeman Mechanical, Inc.
Water Heater Not Working or Leaking? We Can Help! When you have a problem with your home’s water heater, Haldeman Mechanical is here to help. We service oil, gas, and electric hot water heaters. Our technicians are able to quickly diagnose your water heater issue and repair or replace it to minimize the time and inconvenience of not having hot water. We stock water heaters in our warehouse that are ready to install at a moment’s notice. We are available 24 hours a day, 7 days a week to provide fast, reliable service at competitive rates. Our certified plumbers will work hard to restore your hot water quickly. 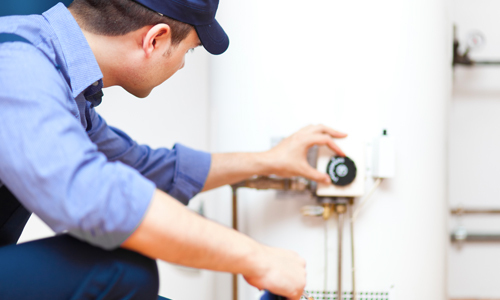 The best time to replace your home’s water heater is before it fails. The average life expectancy for a water heater is 8-12 years. If your water heater is in that age range, it might be time to consider replacement. Haldeman offers many equipment options, including high-efficiency models that can save you money in the long run. We can work around your schedule to find the best time for an install, before it becomes a disruption to your life. Our Customer Assurance Agreement service plans cover all preventative maintenance for your water heater, saving you from costly repair bills and future disruption. We offer three service levels to meet your budget and keep your equipment running at peak efficiency. 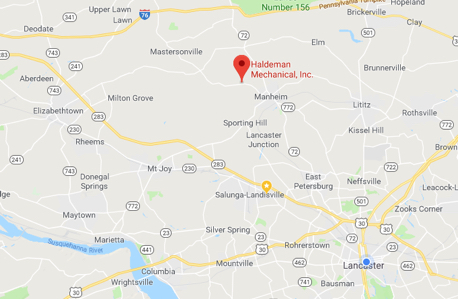 Based in Manheim, we also serve homes in the surrounding communities including Lititz, Lancaster, East Petersburg, Landisville, Mount Joy, Mountville, Elizabethtown, Mount Gretna, and Columbia. Call us (717) 665-6910 or contact us online to receive a quote or to request a service call.